Nina Greschner pitched forward and broke her shoulder in the last eighteen seconds of the Disney on Ice show in which she was performing. The accident changed her life path. Greschner had spent the last ten years working as a professional skater, travelling worldwide with Disney on Ice. Cast as a principal skater (Greschner played Belle from Beauty and the Beast and Gabriella from High School Musical), at the time of her injury Greschner was in Osaka at the start of a ten month contract. It was during her recuperation that Greschner moved to Revelstoke. “My parents had recently moved to BC and I had a love interest in Revelstoke who offered to take care of my during my rehabilitation,” she says. The lynchpin to her choice of residence was the high calibre of physiotherapists Revelstoke had to offer. “I found Helios and learned Lindsay had been a gymnast and Fraser had worked with the Alberta Ballet, I had a great deal of confidence in their ability to help me get back to the level of performance necessary,” Greschner says. Prior to becoming a professional skater, Greschner was a competitive figure skater. Determined and passionate, Greschner was billeted out from the age of twelve so she could reside in a larger centre that offered training year round for competitive skating. Her parents were supportive and Greschner initially lived with her coach. “Kids who pursue high level sports and live away from home are required to grow up a bit quicker,” says Greschner. “You become independent younger. Going through the teenage years in a different environment than your home can be challenging, having a supportive team is crucial.” Greschner wouldn’t trade it away though. After years of training, she competed as a novice ladies for Western Canada. When she was eighteen, she chose to go pro. After the cutting her tour short post recovery and with her professional career coming to a close, Greschner opted to return to Revelstoke as she figured out her next steps. It wouldn’t be long before she joined the Revelstoke Skating Club as a coach. “My neighbour at the time was involved with the club, and they had just lost their head coach,” Greschner says. The club helped her gain her NCCP level one coaching certification. Over the next five years, Greschner coached the kids and took her level two certification. A part of coaching figure skating is finding music for skaters to skate to. “A lot of coaches spend hours researching for music and figuring out how to edit music for their skaters,” says Greschner. Skating programs require edits including blending multiple pieces, shortening or lengthening songs to specific lengths. When a skater’s program components match the music, it noticeably creates the greatest impact for the judges and audience. It turned out Greschner had a knack, and an ear, for creating, blending and editing music. With a background in piano performance, Greschner took a leap of faith and enrolled in the Okanagan College Kelowna Branch in the School of Audio Engineering. “It’s a one year program where we learn audio engineering. 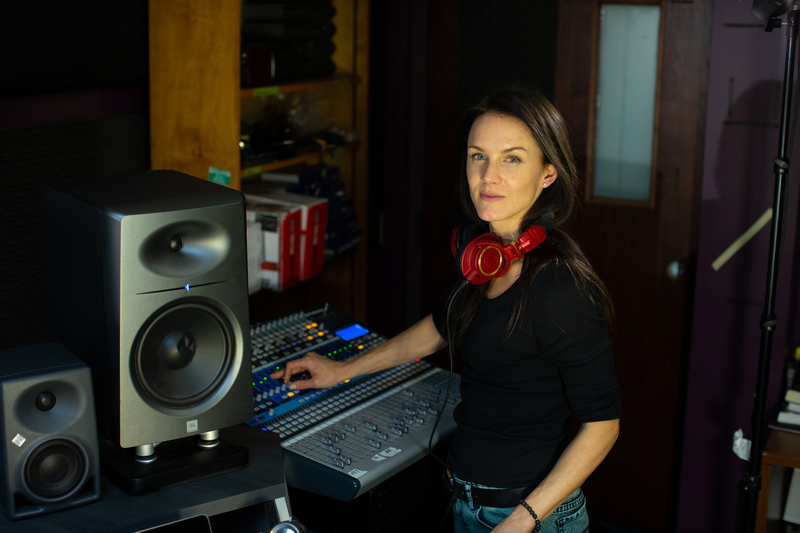 We study mixing and mastering, live sound, studio work and producing,” she enthuses. The program left Greschner ready to launch her own business, Composed Music Services. Since she launched in October 2018, Greschner has a multitude of clients across the country. She’s worked with Disney affiliates and coaches she used to train with. Her reputation is building quickly, and Greschner knows and understands her market. It’s not just skaters that Greschner is helping. Dance studios and coaches struggle with the same issues of creating or altering music to best allow dance expression. Greschner is working on her own composing and piano skills. Her goal is to one day have an Olympian performing to a piece of her music. “It’s a dream of mine,” she says. People who know her would not be surprised if the dream is ultimately attained. Greschner may not realize the example she sets to local youth, whether they are athletic or not. She embodies hard work and dedication, confidence and self awareness. Those traits have allowed Greschner to succeed in everything she’s touched.